New Towns Added to Map! Organizers in Rowley and Lincoln have already turned in petitions with at least 10 signatures from registered voters in their towns. Thanks to them, people at the annual town meetings in Rowley and Lincoln this spring will vote on whether their towns will support Changing the Massachusetts Flag and Seal. Volunteers have also come forward to help put Sheffield and Bernardston on the Change the Mass Flag Map! 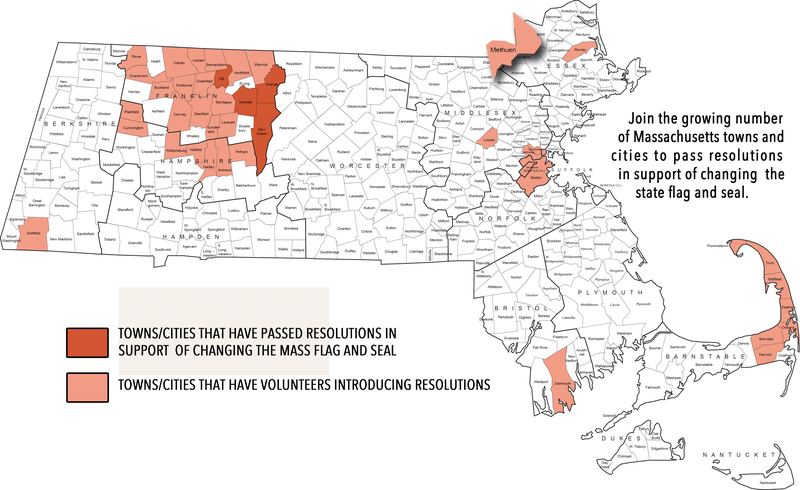 Help us add your city or town to the growing map – from the Berkshires to Cape Cod – of Massachusetts communities that will vote whether or not to support changing the Massachusetts Flag and Seal. It only takes 10 signatures to get a petitioned article on the annual town meeting warrant in your town! Help us Change the Massachusetts Flag and Seal. More Legislators Sign Up to Change the Flag and Seal!!! With the addition of legislators determined to Change the Mass State Flag and Seal like Tami Gouveia (14th Middlesex), Christina Minicucci, (14th Essex), Elizabeth Malia (11th Suffolk), Natalie Higgins (4th Worcester), Jonathan Hecht (29th Middlesex), and Jennifer Benson (37th Middlesex), the bill to change the flag and seal has gained more co-sponsors than ever before.